These tips help you build your mindfulness muscles. We all worry. At one point or another, almost one-third of people have dealt with a level of anxiety that would qualify as a disorder. …a survey of almost ten thousand people across the United States found that with the exception of substance-use disorders, anxiety disorders are the most common mental health diagnosis. In fact, almost one-third of people surveyed had experienced at least one anxiety disorder at some point in their lives (Kessler et al. 2005). Now anxiety and fear are different. Fear is what you feel, in the moment, when someone comes at you with a knife. Fear makes a lot of sense. But anxiety is about the anticipation of an event. Your brain starts asking “what if” too many times, and comes up with a lot of answers it doesn’t like. But you don’t know the future. That “what if” may not even happen. And even if you have a solution, you can’t be sure it will work because your crystal ball is on the fritz. So anxiety is often problem solving — but without the solving part. And in the meantime, you’re lost in thoughts — negative ones — and missing out on the world around you. Chronic worrying is like being on your phone all the time but the screen is showing you a horror movie where you’re the main character. And even if your worries aren’t that bad, if you’re focused on them, you’re not focused on your life. You’re missing out on a lot of potentially fun moments and giving the people you care about only a fraction of your attention. Real life becomes background noise because you’re focused on the endless horror film. So, inevitably, you try and push the worries out of you head, which is inherently problematic because to be vigilant about not thinking about something, your brain needs to keep it in mind. So the pushing away game is like weightlifting for worries; they come back at you with bulging biceps and striated delts. The thoughts just get stickier. So what can you do? Rather than passing through our minds, coming in and then slipping back out, worry thoughts are “sticky.” In fact, that’s why we attach to them. It’s kind of like we get stuck to them as they enter our minds and then have difficulty separating ourselves from them. Therefore, one of the most useful skills for dealing with worrisome thoughts is the DBT mindfulness skill of noticing thoughts without attaching to, reacting to, or acting on them (Linehan 1993b). If you wanted little stop-worrying tips like, “Oh, think happy thoughts and have some soothing chamomile tea” you have come to the wrong place. 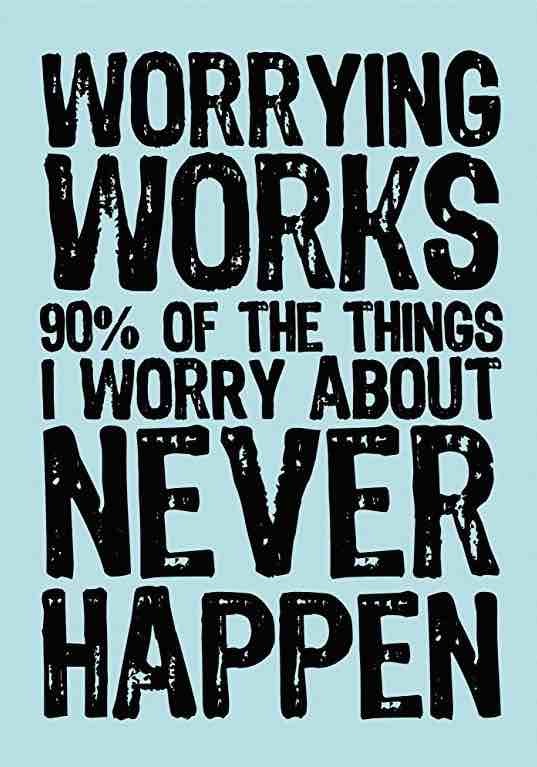 If you’re a chronic worrier, that’s like taking aspirin to treat cancer. Instead, we’re gonna nuke this thing from orbit and watch the ashes dance. Our weapon of choice? A few concepts from Dialectical Behavior Therapy. Originally created by Dr. Marsha Linehan at the University of Washington, it has shown fantastic results in treating everything from anxiety to depression and is the first line treatment for problems as serious as Borderline Personality Disorder — which had previously been regarded as untreatable. It hits your worries with the one-two punch of Cognitive Behavioral Therapy and mindfulness. If the ancient Stoics and Buddhists had gang signs, I’d be throwing them up right now — once again, those guys were ahead of their time. This is not an overnight solution but it’s one that actually works. Those troubling thoughts may be sticky — but with a little work we can give you a teflon mind. If you want to be more mindful, you need to remember three words: acceptance, attention, and labeling. Push back against your worries and they get stronger. So accept their presence. You don’t need to accept their speculative doom-and-gloom scenarios as inevitable; you just need to accept that the worries are here and stop trying to serve them mental-eviction-notices that they’ll ignore. So get out of your thoughts and focus on the world around you. Those “what-ifs” aren’t real. The people around you are. Granted, when you’ve had little practice at it, consistently shifting your attention like this is really hard to do. And that’s where labeling comes in. When a worry pops up, label it as “a worrying thought.” It’s not you. Do not identify with it and let it overtake you. One of the reasons human beings tend to get so attached to and caught up in worrisome thoughts is that we “buy into” these thoughts as literally true. Rather than recognizing that these worries are simply thoughts our minds generated that may or may not be true or accurate, we believe our thoughts and take them to be the truth. Therefore, labeling a thought as just a thought is one way to keep yourself from buying into your thoughts or responding as if they were true. So every day, spend a few minutes being mindful. Your worries are like a passenger next to you on the bus. You can’t shove them out of the vehicle. You accept that they are there. But you don’t have to give them your attention either. Redirect your focus from your internal thoughts to the world around you. Notice the seat beneath you. Notice the sounds you hear. Pretend you’re experiencing everything for the first time. Give the world your full attention. And when those worried thoughts rear their ugly heads again, label them as thoughts. They’re not you, they’re just thoughts. Then, once again, redirect your attention to the world. With practice, your mindfulness powers will grow. Okay, building mindfulness muscles allows you to keep worries at bay and prevent them from emotionally hijacking your mind. But what if the worries sneak past your defenses? Recognizing that thoughts are just thoughts takes practice but you can develop the skill relatively quickly. Dealing with emotions is trickier. And the two tend to gang up on you; negative thoughts producing negative emotions and vice versa — creating a self-reinforcing loop of awfulness. When we get lost in thought we tend to forget our bodies. You need to start noticing the physical sensations that accompany your emotions. Muscle tightening. Shallow breaths. Sweating. Whatever you do when the worrying heats up. These are the canaries in the coal mine. Get familiar with the list. This is like the supercool planning montage in the heist film, setting up all the protagonist’s tricks before they pay off in the third act. This might sound like a lot of planning and preparing. It would be better if your brain had an “off” switch but sadly that’s not available in Sapien OS7. Sorry. So it might seem much easier and more effective to simply avoid things that make you worried. David Barlow, a leading expert in the treatment of anxiety disorders, has said that one of the most important things people with anxiety problems can do is to learn to stop avoiding their emotions (Barlow, Allen, and Choate 2004). Why? You need to prove your worries wrong. If you avoid triggers, that just keeps anxieties alive. When you worry and then see your concerns were silly, over time this produces what is called “extinction.” The worries stop. But if you keep avoiding, you’re teaching yourself that these are things to be afraid of. That’s not the path to “extinction”, that’s “reinforcement.” So worries get stronger. Whenever you have the urge to avoid, you need to realize that’s an opportunity to weaken your worries. It’s a chance to practice. More mindfulness. Shift your focus away from your thoughts and back to the concrete world. Okay, we know the most critical thing not to do… but what’s is the most critical thing to do? Ever look back on a moment of worry and say, “Wow, I was really freaking out”? That’s because you didn’t realize it in the moment. Worries snuck up on you, you underwent cognitive fusion, they overtook you — and you probably went on to make some bad decisions. So the key here is to identify mounting anxiety as soon as possible. You made your list of canaries, right? Great. You want to start recognizing these when they happen so you can prevent the worry train from leaving the station. The better and quicker you can identify the thoughts, body sensations and action impulses that accompany your worries, the faster you can quell them. Don’t underestimate this. It’s incredibly powerful. If your hands randomly started swelling, you had trouble breathing and you broke out in bright red hives, you’d be terrified. But if you had been diagnosed in the past with allergies and knew ahead of time these were the symptoms, you wouldn’t freak out. You’d shrug and take some Benadryl. …the good news is that simply knowing more about the types of things that cue your anxiety or cause you to feel anxious can make your anxiety feel less unpredictable and, as a result, far less overwhelming. When you know what to look for and you identify it, you can control it, or at least cope with it. You’re emotionally housebroken as opposed to letting your feelings pee on the carpet whenever they get the urge. Knowing your patterns can give you a good measure of relief. But once you’ve identified worries are trying to hijack you, what do you do? Distracting yourself is actually quite effective for worries — in the short term. The problem is you can distract your life away if you’re not careful. So the lesson here is that because the problem is anxiety (not fear), because the problem is thoughts (not a real person with a knife), then the solution lies with attention. Ever been overwhelmed worrying about something and then a bigger problem comes up and you completely forget about the original worry? Exactly. So you can shift your attention. Doing it deliberately is the tricky part. This is why we build our mindfulness muscles. You strengthened your attention — now it’s time to wield it like a weapon. Training yourself to accept worries, redirect your attention and label feelings pays dividends over time. Meditation is so hard because there’s nothing going on around you — but mindfulness is much easier when you have something active to engage with. By throwing yourself into experiences, you can leverage their momentum to prevent your brain from shifting back to your worries. Another skill that can help you get in touch with the present moment is the DBT mindfulness skill of throwing yourself completely into whatever you are doing in the moment (Linehan 1993b). The goal of this skill is to immerse yourself in your experiences, connecting with them completely. In addition to keeping you grounded in the present moment, this skill will also help you get the most out of what you are doing and fully connect with your life as you live. So, the next time you notice that you are getting caught up in your worries, practice bringing your full attention and awareness back to whatever you are doing at the time. Focus all of your attention on throwing yourself into the experience. If you get distracted by your worry, simply notice this, and then gently return your attention to the present moment and the activity at hand. We often worry and then try to “not-worry.” Your brain can’t “not-anything”, it can only “do” something else. Some might say, “Isn’t engaging the same as distraction?” There are similarities but subtle differences. Engaging is “going deep” while distracting is a “going away.” When you engage, you do the work of actively shifting your attention and joining the world rather than relying on video games or alcohol to do it for you. So throw yourself into conversations with others. Throw yourself into work or personal projects. This is the path to “flow.” Or look around and appreciate a sunny day — as corny as it sounds. Don’t run away from anxiety; run toward something you want to engage in. Embrace the world outside your head and give it your full attention. We hear a lot about our increasingly limited attention spans. We also read a lot about this being an “age of anxiety.” If it’s not already clear, let me make it downright crystal: these aren’t unconnected. So you’re building mindfulness muscles, you’re not avoiding, you’ve identified your canaries and know to engage to get out of your head and into the world. But we still have yet to actually deal directly with those troublesome feelings. Let’s fix that, shall we? Emotions dissipate with time. They never feel like they will (and that’s why we act on them) but they always do. In many ways it’s analogous to healing: unless there’s something truly serious, it eventually takes care of itself as long as we stop messing with it. But we love to mess with it. We struggle, avoid, suppress and deny. And that’s like emotionally picking at the wound, preventing it from scabbing over. When you tend to your emotions you don’t want to redirect your attention but you still want to accept and label. You don’t want to identify with them but you do want to feel them. Label them to get distance and investigate them nonjudgmentally. Ask yourself, “What is my brain doing? What is my body doing?” The distance is built into the question. You’re not anxious but there is anxiety. The first step is to catch yourself worrying. Identify that you are worrying and tell yourself, Okay, I’m worrying again. The second step is to turn your attention to your body and notice any sensations of emotion that you can identify. You might notice that your muscles are tense, your heart is beating hard or quickly, you have butterflies or a sinking feeling in your stomach, or you feel queasy or nauseated. Whatever you are feeling, simply pay attention to it and notice it. Keep your attention on your body. If your mind strays to other topics or you notice worrisome thoughts creeping into your mind, then gently guide your attention back to your body. Don’t let yourself get involved with your worrisome thoughts. Just notice them and return your mind to your body again and again. Try to label or name your emotion, whether it’s anxiety, dread, fear, trepidation, anger, irritation, shame, or sadness. Tell yourself that it’s okay that you feel what you feel, that your emotion won’t kill you, and try your best to simply let it be there for as long as it’s there. Investigate, accept and label. The feelings will dissipate. It’s a skill. It takes time. But it works. And once you get good at it, it’s like a superpower. So you know how to cope with worries. But how do we prevent them from ever happening again? You feel the canaries, you want to do something impulsive or distract yourself but instead, you do the exact opposite and deliberately expose yourself to the thing that is making you anxious. …opposite action works by helping your brain to figure out which of these places or people are not actually dangerous and don’t need to be avoided. Once your brain makes that connection, your fear tends to diminish, you stop wanting to avoid things or people, and your life opens up so that you have more freedom to go where you want to go and do what you want to do. You should only use opposite action when it’s very likely your worries are irrational. The idea of walking down a dark alley in the worst part of town in the middle of the night makes you afraid because walking down a dark alley in the worst part of town in the middle of the night should make you afraid. We’re trying to overcome anxious thoughts, not real-life muggers. Don’t do anything stupid. Tend to your emotions while you’re doing opposite action in order to make it easier. You were anxious the first time you drove a car or started a job or whatever. And now those things not only don’t worry you, they may even bore you to tears. The best way out is through. Build your mindfulness muscles: Accept, label, redirect attention. Practice daily. Find your canaries: The most dangerous emotions are the ones you don’t know are affecting you. When you can say, “Yeah, this is what happens when the worries start” you’ll not only be relieved, you’ll also be able to do something constructive about it. Avoid avoiding: Avoiding is bad. You’re telling your brain this is something to be afraid of and giving your worries more power. Identify: Worries love the surprise attack. Know your canaries and don’t let anxiety hijack you. Engage: Throw yourself into experiences and give them your full attention. Get out of your head and into the world. Tend to your emotions: Investigate, accept and label. The worries will dissipate. This is an excellent skill to build. Use “opposite action”: As long as the scary thing won’t kill you, do the scary thing and it’ll stop being scary. When you’re stuck in your head, worrying, you are missing out on life. Missing out on friends, opportunities and all the good stuff in the world. Worry comes at a price and that price is nothing less than all that life has to offer. You learn to pay attention to your thoughts, emotions, and experiences in the here and now, and learn to see them for what they are. You learn to step back and notice your current situation, observe your thoughts and emotions, and decide on a wise course of action. Instead of avoiding your emotions at all costs, you can learn to step back and experience them, notice them, and then figure out what to do about them. You learn to disengage from worry, rumination, and obsessive thoughts. You live a richer, fuller life. You enjoy positive experiences more acutely. You learn to be more present with other people. You understand yourself better and with more clarity. Fear makes sense. You should be afraid of the big man with the knife. But anxiety means you are afraid of thoughts. Yeah, nothing but thoughts. Sounds silly when you look at it like that, right? And if you avoid your worries and let them grow stronger, eventually you get afraid of your own brain. And that’s a truly terrible place to be, because at least you can run away from the big man with the knife. But being mindful can make your feelings your friends. When you stop focusing on your worries, you can focus on all that is good in your world.